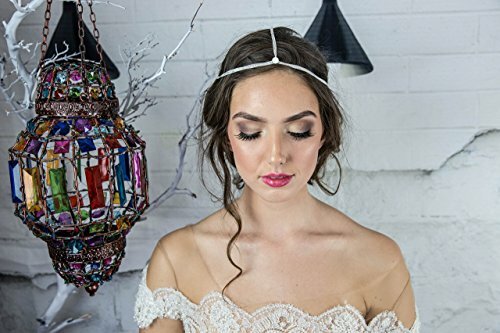 The Angelic Head Chain is new bridal headpiece in our 2018 Bohemian Royal Collection. This hair chain is an angelic statement piece that will leave you feeling feminine and royal. DETAILS: The piece is made with multiple rows of beautiful, dainty white chain. There are two Swarovski stones that adorn this piece and you can choose which stone you would like to sit on the front or back of the head depending on how you style it. One of the stones is a round opal Swarovski stone 8mm and the other stone is a iridescent tear drop stone 18mm X 14 mm with a rhodium plate base. STYLING: The Angelic head chain goes all the way around the head. This piece looks beautiful with an up-do or with your hair down. CUSTOM: We custom make this piece to your head circumference so please choose your measurements in the drop down menu. If you want a certain stone color send us a message. MEASUREMENTS: How to measure your head size: Use a string to measure where you would like to wear the piece on the head and then convert the string length on a ruler. Don't forget to take into account your hairstyle. If for some reason you do not find your measurement on the drop down menu, feel free to contact me!